The nickel charge on many beverage bottles has done a lot of good in its 30-plus years in New York. It’s kept tens of billions of containers from ending up in landfills or as roadside litter, while bolstering the message about the importance of recycling. But it is overdue for an overhaul. Gov. Andrew Cuomo proposes to expand what’s known as the bottle bill beyond water, soda and beer to include most nonalcoholic beverage containers — glass, plastic and cans — to the list of those eligible for redemption. That includes products like sports drinks, energy drinks, ready-to-drink iced teas and iced coffees, and fruit and vegetable drinks. 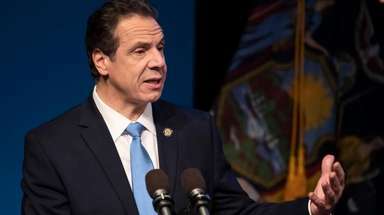 But the ultimate success of the expansion Cuomo will present in his budget address Tuesday will depend on the details of the rollout and how far he is willing to push it. NYC recycles less than 20 percent of its garbage. But the state says 65 percent of bottles and cans with nickel deposits on them are redeemed. So putting more bottles into the deposit program is a good thing. Also welcome: Cuomo’s order to the Department of Environmental Conservation to study the possibility of adding wine and liquor bottles to the bill. They should be included. Cuomo also should raise the fee from a nickel to a dime to further incentivize good behavior. It won’t cost consumers anything — if they return the bottles. Much of the impetus for the governor’s proposal comes from the ongoing recycling crisis, which began when China drastically cut back on material it would accept from U.S. sources. The commodity affected most was glass, which is increasingly being dumped in landfills. Cuomo’s changes would procure more recyclable glass. Now the state must help build a local market for that glass. The DEC has worked with recycling industry officials and municipalities on creating a path forward, a promising development. Municipalities can play a role by, for example, crushing the glass they collect and using it as roadbed material and backfill for pipes for drainage, water and sewers. Expand the bottle bill, yes. But make sure all else is in place to ensure its success for another 30-plus years.